The National Audit Office has today published its findings from its investigation into realising the benefits of the St Helena Airport project. The airport is now built, and has been certified, and was due to start operating in May 2016. However, in April 2016, the St Helena Government announced that further safety and operational work was required to address the impact of difficult wind conditions on landing the plane safely. This investigation looks at the key assumptions in the Department for International Development’s cost-benefit analysis to support its investment in the airport. It also considers the Department’s ability, in partnership with the St Helena Government, to realise the benefits from improved access to the island that they expect the airport will provide. The Department for International Development supports St Helena financially through subsidies and other funding. For 2015-16, the Department estimates that it will give the St Helena Government £16.7 million to fund the gap between its revenues and the costs of its public services. It will provide a further £2.7 million to run the Royal Mail Ship (RMS) St Helena, the only way to access the island; and £7.2 million to help the island attract the skills it needs and to fund capital projects. 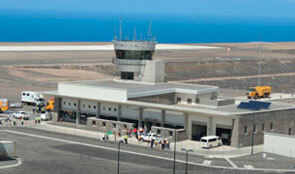 The Department has clear objectives for its investment in an airport on St Helena. The Department’s aims for the airport are to maintain access and, by increasing tourism, investment and population growth, to lead to St Helena becoming financially self-sufficient. It anticipates that this will in turn remove the need for a subsidy from the UK. The Department’s decision to go ahead with the project to build an airport on St Helena was based on a business case which considered different sea and air access options. These included continuing to fund access to the island by sea, via successive replacements of the RMS St Helena. In October 2011, the Secretary of State approved the business case to build and then operate an airport on the island. The direct cost to the Department of the project was estimated at £285.5 million. The Department’s cost-benefit analysis for the airport showed a positive outcome in terms of investing in the airport. The Department described the project’s net present value (of £19.1 million) and benefit cost ratio (of 1.06) as ‘relatively modest’ however. The Department strengthened its case for proceeding with the airport when it considered non-monetised benefits, such as reversing the decline in the island’s population, access to improved medical services, and improved employment prospects. The Department forecast that it would stop paying its annual subsidy to reduce the St Helena Government’s budget deficit in 2043, assuming the airport opened in 2016. The Department’s cost benefit model for the project is particularly sensitive to two assumptions – the number of tourists who will visit the island once the airport opens and the amount they will spend. If spending per tourist per day is £195 (a maximum amount based on the Department’s inquiries on the island in April 2016), estimated benefits exceed estimated costs. If spending per tourist per day of is £82 (the minimum amount), estimated costs exceed estimated benefits. St Helena has sufficient accommodation for the number of tourists projected to visit in the first six years of the airport’s operation in terms of bed numbers (assuming visitors are spread evenly over the year and that they do not stay for more than a week). But the St Helena Government recognises that it needs to improve the quality and type of accommodation on offer. The Department’s estimates show that its subsidy to the St Helena Government will be less than had it decided to replace RMS St Helena. The Department has estimated that the total subsidy it will pay between 2011 and 2043 (the year work on the airport started and the year it estimates that it will no longer pay a subsidy) is £667 million. In comparison, its total subsidy over the same period would be £834 million had it decided to commission successive replacements of RMS St Helena instead. The Department could incur additional costs as a result of delays to the opening of the airport. The Department and the St Helena Government are currently considering options for addressing the impact of difficult wind conditions on landing the aircraft safely. The Department has not yet forecast the additional cost of each option. The Department is underwriting the cost of the air service for the first three years of its operation. The Department told us that, in order to attract interest in operating the air service from South Africa to St Helena, it had to cover the risk that demand was less than capacity for the first three years of the service’s operation. The Department’s maximum potential liability in the first year of the airport’s operation is £1.9 million.